People are never on the fence about Bubble Tea. They either love it or hate it. Usually those that have a distaste for mixing textures don’t appreciate the gummy tapioca balls surprising them during a sip of Thai tea. For those of us that love bubble tea, there’s no greater sight than seeing your neighborhood bubble tea guy stopped on the side of the street as you’re heading back to the office after a lunch break. 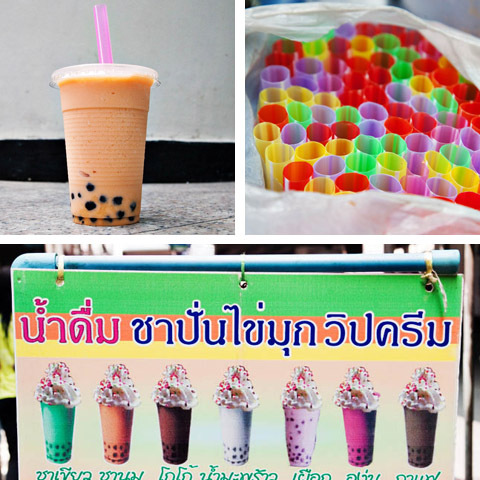 My personal favorite variety of bubble tea is the ice slushy/frozen version found on the streets of Bangkok. The tea is sold by nomadic vendors pushing stainless steel carts around the city. They have a standard path they push every day, but where they’ll be at any given time depends on a combination of business, traffic, and how they feel. Maybe a lunch rush today near the first intersection held him up… so you won’t see him near your office during your lunch break today. Or maybe the school group didn’t stop by today and so he shows up 2 hours early. The bubbles are typically made of a combination of tapioca and carrageenan powder. The “pearls” are made early in the day in a large batch and kept in a jar of liquid to be scooped into a usually freshly made drink. 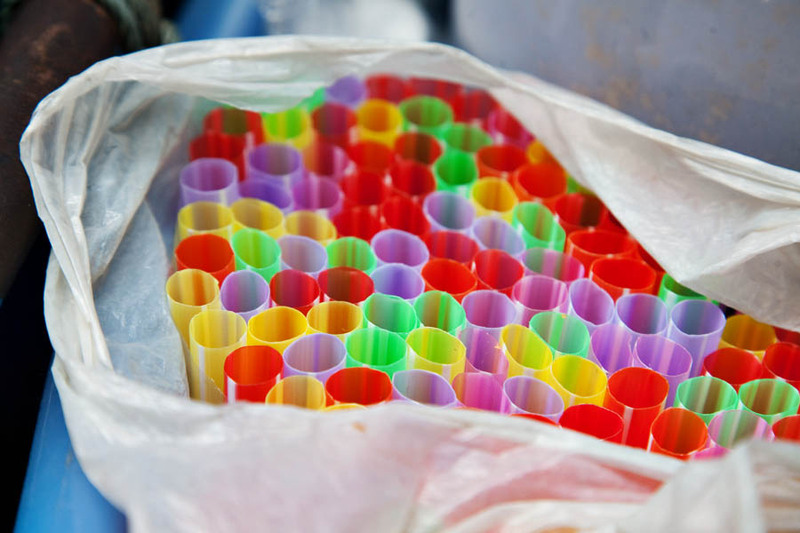 Some shops sell it as an add on and others have specific drinks that utilize the gelatin balls. The balls themselves add little flavor to the drink and will take on the flavor of whatever they’re in. They’re mostly there for the texture and to give you something to chew on while drinking…. think of drinking bubble tea like having a tea or coffee and eating a packet of gummy bears. 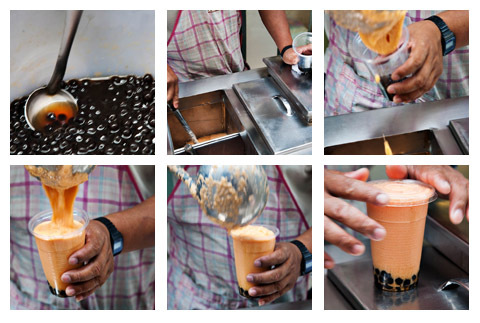 My bubble tea guy is the one walking the street near emporium and the Queen Park along Sukhumvit road. He was my first. He walks a smart, foot-traffic-heavy street. You can find him in between Soi 24 – 26 normally just after lunchtime. He’ll hang around there for a couple hours if you’re lucky before cleverly moving down in front of the Queen Park… catching all the people who have just finished running in the park (“Yes, I think I will treat myself to a bubble tea after my hard run”). Three years of service later and I don’t have to say a word…he’ll spot me, I’ll nod ever so slightly, and with a swift set of motions I have my Chai Yen Ban Sai Khay Mook (Thai iced tea with bubbles / pearls). Almost as great as the taste is the price. 10 baht for a regular sized cup and 15 for a larger cup. If you smile and come regularly, for no extra charge, he’ll scoop an extra set of bubbles on top of the drink. Had bubble tea? What’s your favorite version? What drink does it work best in for you? Yes, they are sometimes hard to find. 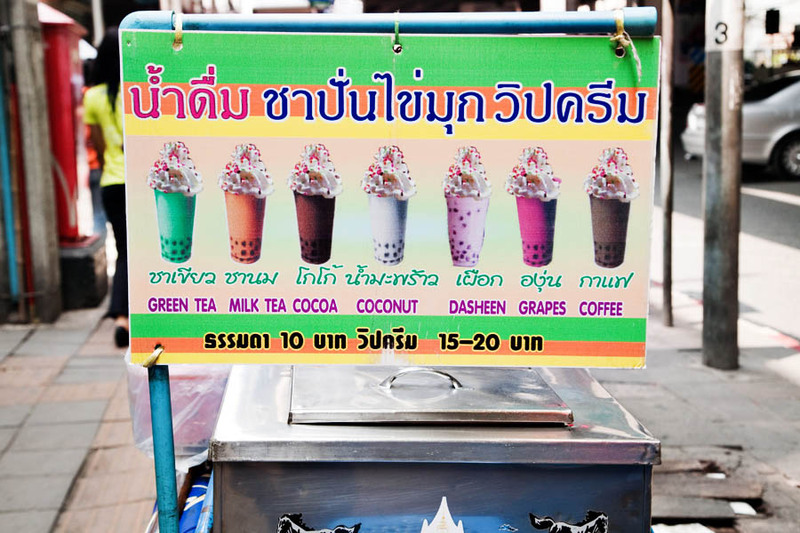 I remember in Ayutthaya I was looking for the bubble tea fun drink carts and they were nowhere to be found unfortunately. So when you see a vendor, be sure to grab one of those “fun drinks”. 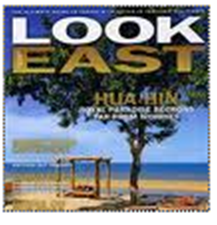 Hi Paul & Joanna- I just stumbled upon your site while researching dining options for our upcoming trip to Bangkok. I have been pouring over your posts and am just so grateful to have found you. You have such a fantastic resource here – beautiful photos, insightful reviews. Excellent. Travelling to Bangkok soon, and I am hooked on bubble tea here in oz, at 6.50au a cup it costs me a fortune. Better be sure to take loose clothes, I am surely going to overindulge when in bangkok. I am staying on Sukhumvit Road, so I will be sure to look for him daily! They are sold from carts on the street. No need to speak Thai, just point at the flavor you want to order Good luck in Bangkok. I loved living there.